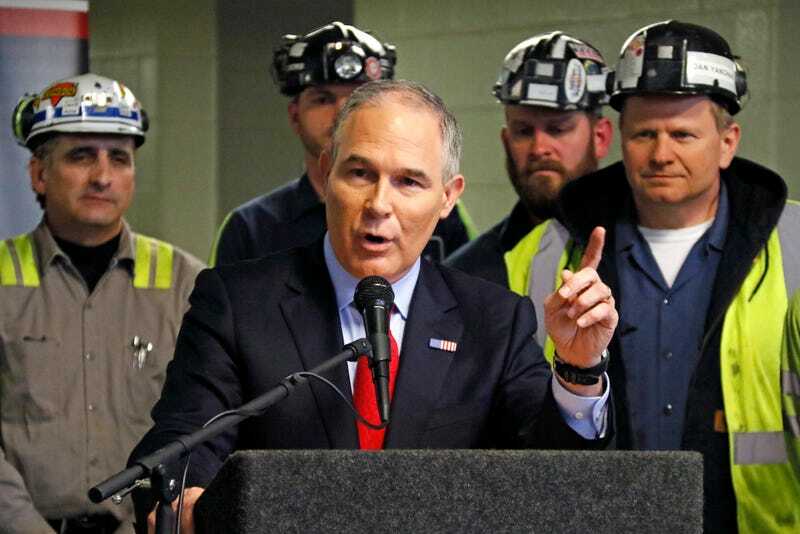 On Thursday, EPA head Scott Pruitt visited the Harvey Mine, a coal mine in western Pennsylvania, to regurgitate some of his favorite talking points—that the EPA is an unhinged, anti-coal agency that he’s reining in through systematic self-destruction. Pruitt promised the “regulatory assault” on coal was over, saying the EPA will be protecting the environment “the American way,” and insinuating a return to the glory days of American coal production circa 1958. [Deiuliis] acknowledged that a relaxation of regulations on mining and carbon emissions under the Trump administration would help coal. But not enough to persuade Consol to stay in it. If anything, the optimism injected into the coal sector by the election result and the re-emergence of large miners from bankruptcy ... simply provides a window to offload the business. The consensus among energy experts and economists is that competition from natural gas and green energy sources like solar and wind power, which are cleaner than coal and whose costs are falling rapidly, is having a much greater impact on the mining industry than environmental regulation. That doesn’t stop Pruitt from promising that by relaxing restrictions on carbon pollution and toxins like mercury, he and Trump can revive the industry. One of Trump and Pruitt’s main Obama-era regulatory targets is the Clean Power Plan, a rule that mandates states curb power sector carbon emissions. While Pruitt and others blamed the CPP for layoffs in the mining industry, the architect of the plan previously explained to Gizmodo that the shift away from coal was happening long before the CPP enacted. It certainly makes sense that overzealous regulations could lead to job losses, but when it comes to the CPP and coal, it’s simply a lie. As part of its commitment to the Paris agreement, China projected 2030 as the year its emissions will peak, continuously declining thereafter as clean energy continues to boom. But it’s absurd to insinuate that they have “no obligations” over the next decade. China is the world’s largest carbon emitter, and peaking emissions in only 15 years is an enormous undertaking, requiring a massive restructuring of the energy consumption habits of over a billion people. And China is actually ahead of its goals. Because while Pruitt insinuates that China gets to take it easy for a decade before committing to Paris in earnest, China is accelerating the transition off fossil fuels, recently cutting 500,000 coal and steel jobs across the country and setting global records for investments in renewable energy sources. So does Pruitt simply misunderstand the language of the Paris agreement, or is he intentionally distorting semantics to bolster his narrative? Pruitt’s war on regulation rests comfortably on these sorts of half-truths, but, when this long-awaited resurrection of the coal industry doesn’t come, he’ll need new talking points.